My Work with the Search and Rescue Man Ranger Oakes as Told to Harry E. Oakes Jr.
Tanja's Secret Doorway to Freedom -- M. E. Martucci, Ph.D.
How a Cat Helped Me Cope with First-Time Parenthood -- Deb. W.
What Have the Angel Animals Taught You? Excerpt from the Introduction to Angel Animals by Allen and Linda Anderson. What Is the Nature of Animals? We defined angel animals by going back to the Greek derivation for the word angel, which is angelos and literally means "messenger." Angel animals are messengers. They assure people that God's love, guidance, and protection are always near. Angel animals can be daily pet companions or animals in nature. They naturally demonstrate spiritual qualities, such as gratitude, courage, and forgiveness. They connect each of us to our higher nature; beyond thought and emotion, they love unconditionally. If you hear the spiritual messages angel animals send, you will improve your relationships and ability to handle life's challenges, as well as increase your understanding of the spiritual realms. To bring the concept of angel animals into the world, we began to research books about animals. We found a debate raging that often consumed pages of text. Authors and scientists expressed concern or offered arguments to prove that their observations about animals were not merely anthropomorphic. In writing this book, we are not presenting views of animals that only reflect human behavior, which would be considered anthropomorphism. In the stories we are sharing, animals use their own type of logic. They strategize. They feel. They remember, interpret, and make choices. Skeptics might dismiss the incredible events of these stories as mere coincidence. Because of the volume of anecdotes and examples, combined with our own experiences, we have come to accept animals as conscious spiritual beings with spiritual natures. We believe that rather than viewing life as humans do, animals have unique perspectives that are as low as a person's ankles, as high as the sky, and as expansive as eternity. Not being theologians, we don't feel the need to present arguments about whether or not animals have souls, go to heaven, or return after death in miraculous ways. Some contributors in this book, like us, believe all of these things about animals are true, and others don't believe much or any of it. Their stories often raise more questions than they answer. Just as humans have a spiritual dimension in addition to mental, emotional, and physical aspects, so do animals. Animals - rather than being saintly - act as humans do, from the level of base instinct all the way up the scale to displaying spiritual virtues. Yet it's remarkable how often animals choose higher rather than lower paths. We marvel at how many animals are naturally compassionate and forgiving, instead of clinging to fear, anger, and mistrust. We know, as do many people who live with animals, that animals enrich humans' lives spiritually. We made a point in this book of presenting possibilities to consider rather than lecturing about what people should or should not believe. Even though some churches invite animals to their services (Linda had a funny moment in Africa with a chicken who regularly attends the worship services), animals don't belong exclusively to any one religion. Angel animals demonstrate how to be truly religious by tuning in to the spiritual essence that connects all life and by acting as messengers of God's love in this world. Mystical animal images grace Ice Age caves. From earliest times, dogs have been companions for people. Of course, cats wait with dignity to be restored to their rightful pedestals and worshiped as the deities they were in ancient Egypt. Artists depict humans flying on winged horses. Since the dawn of civilization, humans have known what many today are rediscovering: When you look into the eyes of angel animals, you can see their spiritual natures. You see yourself reflected in their gentle gaze. You see the work of a loving God. 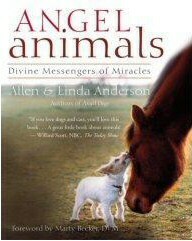 Excerpt from Angel Animals by Allen and Linda Anderson. When D.C. came into my life I'd just about reached the bottom of a long trip through the depths of alcoholism and was on the verge of losing everything I had, including my family. Those nearest and dearest to me still held on to a spark of love, but even they didn't want to be with me for more than a few minutes at a time. My emotional state had deteriorated to the point that I'd already decided I didn't want to go on living. I was desperately trying to drink myself to death. Feeling that there was no purpose to my life, I was approaching the time when I would have nerve enough to take more effective steps to end it. One day, in a stupor, I stumbled to the back door and looked to see what it was like outside. I spotted a little, skinny kitten in the neighbor's yard. He looked up at me and somehow knew, without question, that he'd found a cat person. You can change that to "sucker" if you want, because I've always been a real sucker for cats. I think that one quick glance across the yard cemented our relationship. The cat didn't hesitate an instant, didn't even wait to be called, just came running and jumped over the fence. He bounded up the steps and planted himself against my leg, as if staking his claim. I didn't know it then, but this cat would remain pretty close to that leg for the next fifteen years. For a few weeks, neither of us acknowledged that he'd become my cat. He was supposed to belong to our neighbors. They probably thought the kitten still belonged to them, but I already had his heart and unflagging loyalty. When I met D.C., we were both rejects on our way to being booted out. We were to form a very special kinship. It was really something to see D.C. come running from under the neighbor's house when I'd bang my screen door. The sound alerted him that his new buddy was up and around and the food dish would shortly be brimming with goodies. He also knew he'd get lots of patting and rubbing before being allowed to sleep in a nice soft bed instead of on the dirt under a mobile home. When I first met the little orange kitten, it seemed as if he could never get enough to eat. His face was always down in the food dish, and every time he came up for air his chin was dirty, because he really burrowed in. He wasn't my cat then, so I didn't give him a name right away. Instead, I called him Dirty-Chin, Little Old Cat. That was quite a mouthful and eventually my daughters suggested it would be easier to just name him D.C., short for Dirty-Chin. After we completed the process of stealing D.C. a little more each day from our neighbors, who moved away without taking him with them, we put "D.C." on his medical records, and that officially became his name. D.C. wasn't afraid of me at all and after a good meal he'd follow me back into my bedroom where I spent more and more time in my own foggy world of misery and despair. He didn't seem to mind the smell of unwashed human or spilled beer and bourbon. In fact, he'd jump up on my chest and thoroughly clean my beard with his tongue, going at the task with a purpose. In those moments, I felt a strong bond growing and knew that of all the cats I'd loved, this one was going to be very important to me. Once D.C. was missing for eight long days. I knew he wouldn't voluntarily leave and expected the worst. I was one very miserable person without my pal. 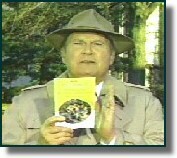 Scouring the neighborhood, I desperately feared finding his lifeless body. He eventually showed up, tired and very dirty. He acted as if he'd been out for a casual stroll, but his paws told a different story. The pads on his feet were almost worn off, indicating that his journey home had been a long one. Apparently, someone had taken him away, but my buddy managed to find his way home. The hungry little fellow really buried his chin in the food dish this time. My sickness progressed to the point that I finally decided to take my own life. Just about the time I was preparing to do the deed, D.C. came in and said, "Cut out whatever you're doing and come feed me." You might be skeptical that the cat was actually talking to me. If so, you just don't know how strong the bond was between us. Or you don't know drunks very well. D.C. and I talked to each other a lot. I stopped what I was doing and went into the kitchen to feed him. I might have been planning to end it all, but I had my priorities straight. When this cat was hungry, he had to be fed. Somehow, D.C. had sidetracked me from my mission long enough for me to realize two things. First, I wasn't in any condition to make such a serious decision as ending my life. And second, at least one of God's creatures might miss me if I wasn't around. I began to think that maybe there was a purpose for my life, even if it was just to feed that little orange cat. My alcoholism worsened until I finally got sick enough to call for help. I went into an alcohol rehabilitation treatment center. There, I came to realize that D.C. had come to me when we needed each other. He'd needed me to open a door and take him in. I needed him to open a heart and let me in. For reasons I don't understand I couldn't hear the humans who had tried to help me. But I heard D.C. loudly and clearly. Why he was able to stir the remaining spark of humanity in me is a mystery. If I wanted to have him back, I knew that I must successfully complete my treatment. I had to live. With a new purpose, I finished the program and have been sober ever since. Old age and past injuries finally brought the little cat down. D.C. had arthritis, which caused bone spurs to develop so that walking was very painful. He couldn't see much anymore, and although we still called him our guard cat, he'd quit climbing to the top of the car to do his tour of duty. He'd settled for sitting on the back stoop and watching for intruders. He no longer went with me when I walked the few yards down to my mother's house, where he had a special place on his very own footstool. When I returned from those visits, he couldn't bound up the street to meet me because he didn't recognize me until I was close. And he simply no longer bounded. D.C. still demanded his place on my lap even though the pain of getting up and down must have been terrible. I'd try to talk him out of it, telling him that he could stay beside my feet, but he'd have no part of it. Then he would scratch my knee and look at me with pleading eyes until I lifted him up. He'd cry out, and when the pain was exceptionally severe, as an automatic reflex, he'd bite me. D.C. would apologize for the unintentional bite by licking my chin until it nearly bled. He didn't need to apologize. I knew the end was near and I even cherished his bites. Maybe it had just been my imagination all those years when I swear the cat talked to me, because when I really needed him to speak, he didn't. He'd sit on my lap and stare into my eyes. I desperately wanted him to tell me it was okay to do what I felt must be done. I hope I heard him correctly, because I couldn't stand to see the pain in his eyes anymore, and we knew we had to end his suffering with euthanasia. I relied on my Alcoholic's Anonymous twelve-step program. I prayed to God to show me what to do and give me the strength to do it. Somehow, I made the decision, but I couldn't take that long, last trip to the veterinarian's office. My wife took care of the awful job. I'll always be grateful to her for making such a sacrifice. I have no doubt that D.C. saved my life. He gave me something to live for when I didn't think I had anything. Because of those extra years, I developed a real friendship with my wife, even though I'd nearly driven her out of her wits. Because of D.C., I lived to know and desperately love my wonderful grandchildren. Today, I have completed a successful career. I've turned into a much better person than I was before D.C. and I met. I could write a whole book about the wonderful times D.C. and I shared and the things I gained because of him. Because D.C. gave me a reason to live, I had to write this story to celebrate his life. Having his name in print for others to see acknowledges that D.C. was Somebody with a capital S. Because he existed, I lived to sit at a keyboard and write about my pal. About how he made a human being out of me. About how I tried to make one out of him. I think we each came pretty close. "They’ve been with her since her childhood, when they helped her with stressful times of growing up and childhood diseases like the measles. They’ve helped her through three divorces, a suicide attempt, and the deaths of her best friend and mother within a few months of each other. . . . Her story is one of more than 100 stories gathered in Angel Animals." "Linda and Allen Anderson think their pets are out of this world. The Minneapolis couple recognizes a ‘spiritual connection’ with the animals they have love and learned from over the years". "Allen and Linda Anderson, publishers of the Minneapolis newsletter, Angel Animals, and a forthcoming book on spiritual lessons taught to humans by animals, will present a San Francisco workshop today for the Learning Annex."